I returned to the small town of Richford, Vermont, as the starting point of my travel plans for this Spring. 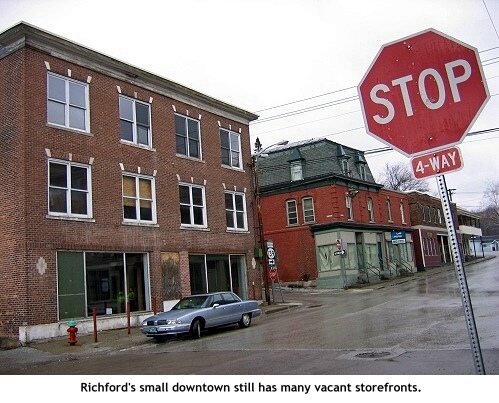 I had visited Richford last Summer to first learn about the Main Street Mill redevelopment (see photo below). It offers a fascinating look at how one small town created, and capitalized on, an opportunity to begin rebuilding its downtown. Al Perry grew up in Richford, next to the Town Hall. Perhaps that explains why after many years away -- including service as a U.S. Navy submarine commander -- he returned to Richford to a life of community involvement. Besides serving as the area's representative in the Vermont Legislature, Perry has helped shepherd through a complex redevelopment project in the heart of town. 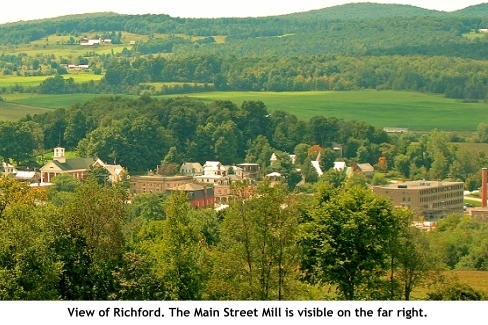 Richford is a mill town (pop. 2,321) along Vermont's northern border with Quebec. More accurately, it is a former mill town that has been struggling economically over the past twenty years. And that's where the redevelopment project comes in. 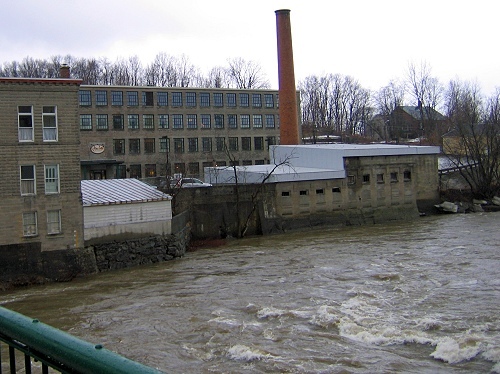 It has involved "recycling" a former mill building along the Missisquoi River, right in the middle of Richford's small, struggling downtown. What makes the Main Street Mill project especially interesting is both the mix of uses that now occupy the mill, and the creative way in which the redevelopment came together -- involving the combined efforts of the town, a statewide housing non-profit organization, and a private developer. 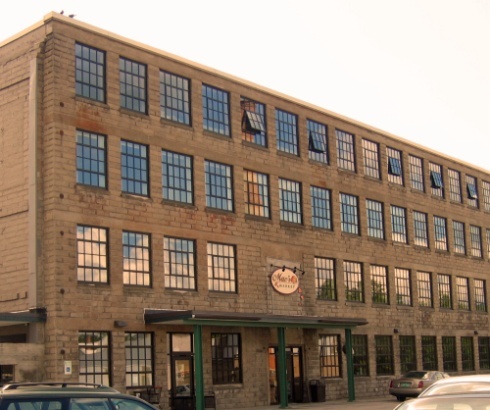 For many years, what is now the Main Street Mill (built in 1929 and containing some 47,000 square feet of space) had been part of a complex of buildings owned by the Sweat-Comings Company. For much of the twentieth century the company -- which manufactured hardwood furniture -- had been the town's largest employer, paying the wages of hundreds of local mill workers. But the picture started to change in the 1960s as area mills began to close. When Sweat-Comings finally ceased all operations in 1996, a major gap was left in the local economy. As Perry describes it, the town badly wanted to replace those lost jobs. The initial focus was on trying to re-establish the local wood products industry -- not surprising given the heavily forested part of Vermont that Richford is located in. But after business recruitment efforts went nowhere, efforts shifted to a strategy to boost local tourism (primarily to draw in Canadian visitors) and provide needed local services. The mill building would become a core element of both efforts. One of the initial challenges, as Perry explains, was the existing condition of the mill buildings, making redevelopment a daunting prospect. 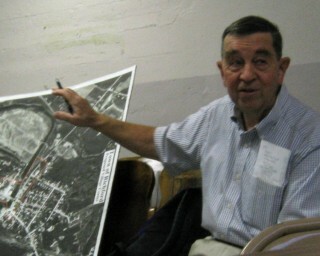 With $1 million in Community Development Block Grant funds, the Richford Main Street Mill Development Corporation spent the good part of four years (2000-2004) working through building stabilization, demolition of unsafe structures on the site, and substantial environmental clean-up, including the removal of asbestos. 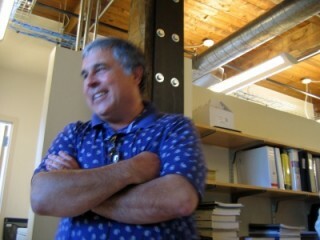 But it was essential that tenants be found for the $7.4 million dollar project to move forward. What emerged was part good planning and part serendipity. 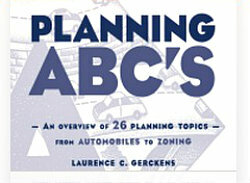 The results: three very different, but equally important, uses for the building. As Kenn Sassarossi of Housing Vermont (one of the partners in the redevelopment) put it, Richford "hit the perfect trifecta." Through its partnership with Housing Vermont, the third floor of the Mill has been converted into twelve affordable apartments. This has already enabled some local residents to stay in town. On the ground floor, Mac's Market a regional grocer based in Rutland, Vermont, has opened a 10,000 square foot market -- the only grocery in town. Part of this involved serendipity, as Al Perry recalls a trip to Stowe with his wife a few years ago where they happened on the Mac's Market there. Perry immediately thought Mac's might be a good fit for the Richford project. But making this happen required considerable follow-up, and the market's own retail analysis, before the store became a reality last year. The third major tenant also provides an essential service -- in this case, health care. 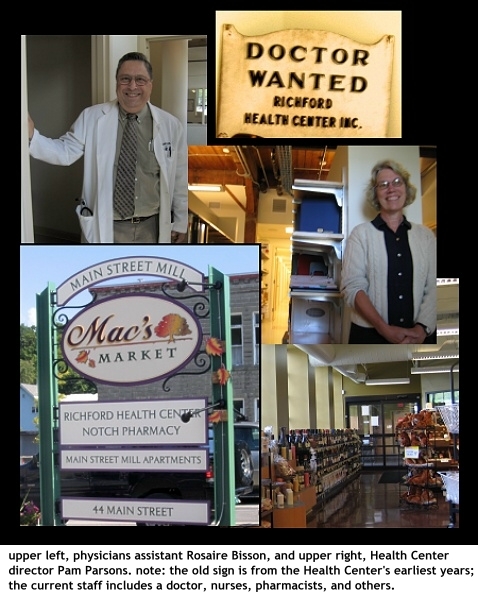 The Richford Health Center moved out of its existing overcrowded quarters down the street into the Main Street Mill. This move also enabled it to expand its operations. The result is 40 employees now working in the Mill (the Health Center also operates health care clinics in four other communities, and has consolidated its administrative functions in the Mill). 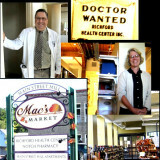 The Health Center is already considering expanding to the top floor of the Mill, and adding a dentist to its practice. Pulling all the pieces of the project together required the assistance of financial and development experts from the Hartland Group based in Burlington. This helped lead to the first use of federal "new market" tax credits in Vermont, an essential component of the financing package for the project. As Kenn Sassarossi told me, what really made the Richford project work out was the collaboration between local officials and citizens "who know what's needed in their town," and outside experts who "can help shape what's actually possible." Why did Housing Vermont, a statewide provider of affordable housing, take a key part in the Main Street Mill project? Sassarossi explains that his organization increasingly sees the value of mixed-use, downtown projects. This makes the housing more attractive, as tenants also have essential services nearby, and have less need for having to own a car. There are also some practical benefits to mixed-use. One example Sassarossi pointed to was the fact that the cost of putting in the needed elevator was shared by the key participants, and not solely borne by Housing Vermont. The Mill provides vivid evidence that Richford is coming back. As planning commissioner Eric Collins noted, "the project is the stepping off point for other economic development efforts." To that, Al Perry added the reminder that "it took the determination of the community for the Mill project to get done, and some outside help," also reflecting that "the limiting factor in small town redevelopment is not financial capital, but human capital." Perry, Green, and others I met with believe that having an attractively restored building in the very center of Richford will also encourage visitors to stop and spend some time in town. Efforts are also underway to boost recreational use of the river and link the 26 mile long Missisquoi Valley Rail Trail-- which now runs from St. Albans to Richford -- into Quebec. Planning Commission Chair Marion Paul told me that the town is looking for ways to stimulate more recreational opportunities, including facilities for bicyclists and kayakers. While Richford still has a way to go to return to its heyday as an economically thriving town, the Main Street Mill development is surely a very important step in that direction.